A few years ago I acquired some old Tyco train set equipment. Most of it was in poor shape and wasn’t of the greatest quality to begin with. My first instinct was to get rid of all of it. But then I thought that maybe I could recycle some of the models. In the end got rid of all but two cars that I thought had some potential. I wanted to see if I could make something out of them that could stand alongside some of my more detailed models. 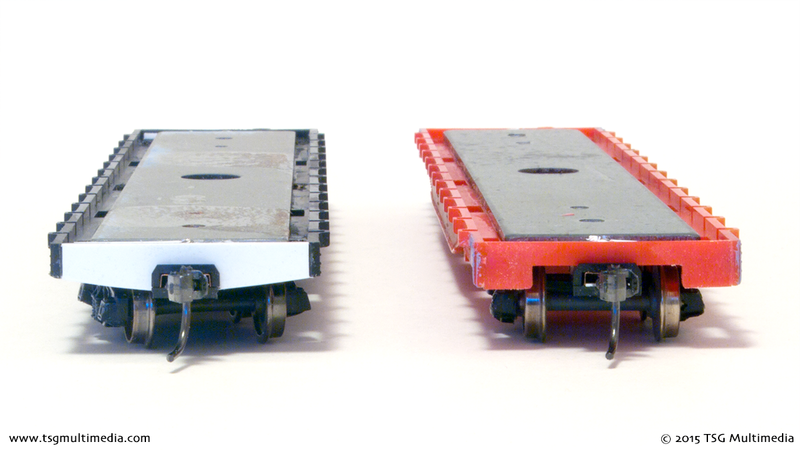 Both of the cars I saved were based on the same flatcar body. 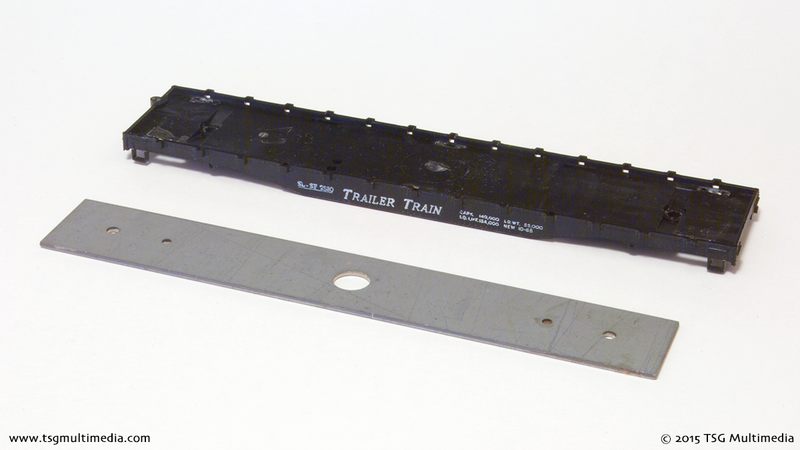 The flatcar part was actually a decent model. I disassembled both cars and got rid of the trucks, couplers, and superstructure. The only parts I saved were the flatcar bodies and the weights. These parts would be the basis for my new models. I always start by making sure a piece of rolling stock will operate. I body mounted Kadee scale couplers and installed some Kato trucks. 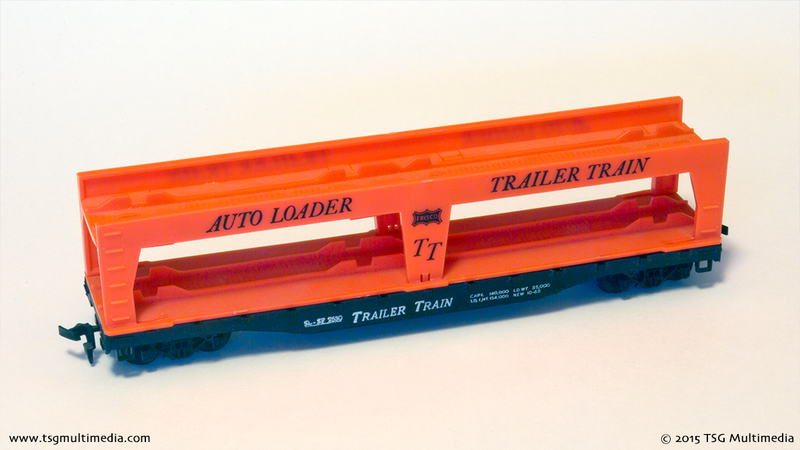 I had to modify the bolsters on the cars a bit to fit the new trucks. I made sure all the wheels were in gauge and that the couplers were at the right height. The cars came with truck mounted couplers and as a result had a huge gap in the ends to allow the couplers to swing side to side on curves. I made new ends for each car out of sheet styrene. The cars don’t follow a particular prototype. 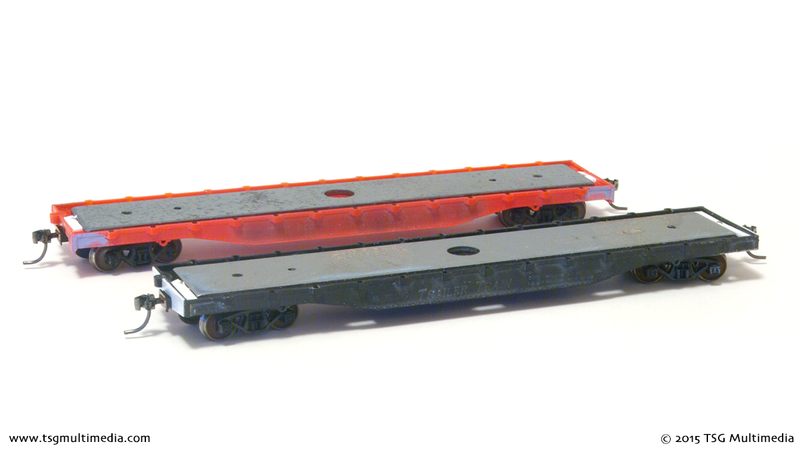 I based the design of the ends on pictures of similar flatcars. In the above picture the car on the left has the new end installed. 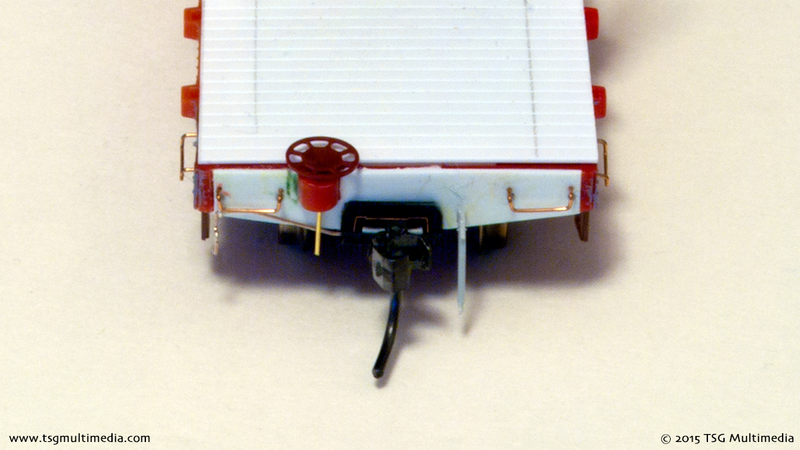 I added new decking to the tops of the cars made from grooved styrene sheet. I also added brake hoses, uncoupling levers, and free standing grab irons with nut-bolt-washer castings. The original stirrup steps were cut off and replaced with aftermarket parts. On the “B” end of each car I installed a Kadee modern brake wheel. I could have stopped there and had a couple of decent flatcars. Then I found some Details West log bunk castings. 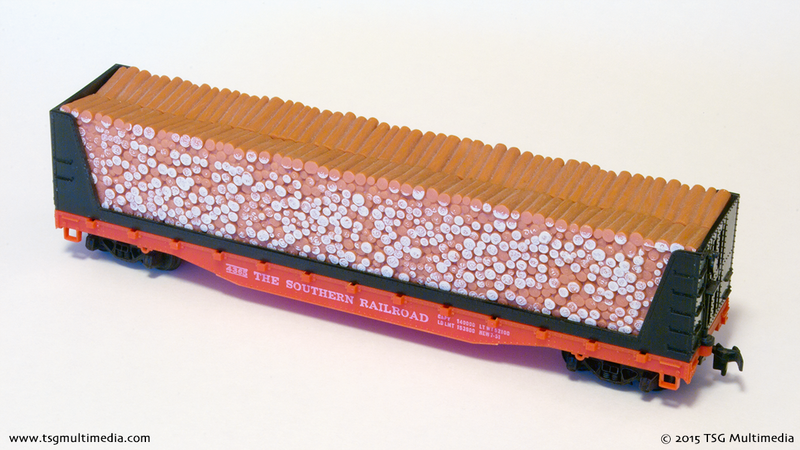 I thought that these models would be great modern log cars. I drilled mounting holes for the log bunks in the decking and test fit them. 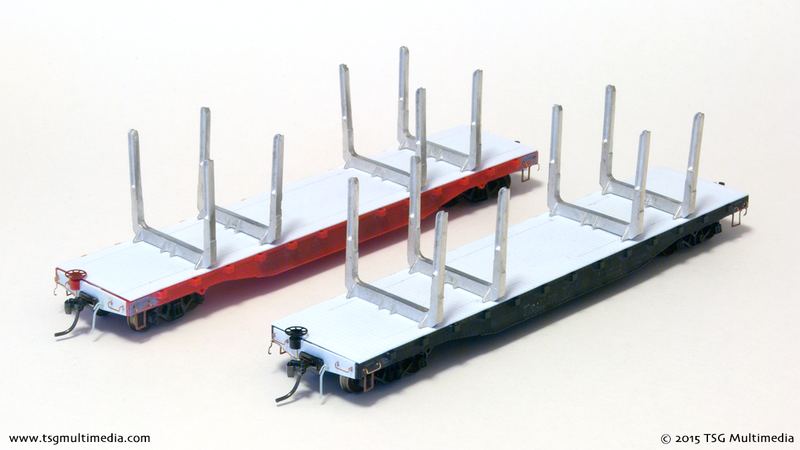 I didn’t glue the log bunks to the decks until after the models were painted.